Lorenzo Brusci and the Timet collective have been composing electro-acoustic music for more than 11 years, designing sounds and music compositions for theatre, dance and television; performing concerts and setting up installations all around Europe. One of Timet's main tasks has been to overcome electro-acoustic lack of physicality and narrow emotional reference, participating in and producing many sound architecture projects and immersive sound experiences. 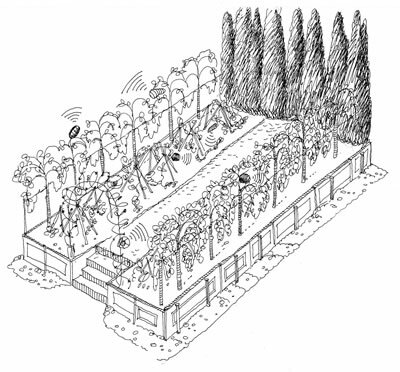 In August 2003 I invited Stefano Passerotti, gardener in Florence, to consider the possibility of including sounds, music and sonic objects in the design and realization of gardens and parks. My idea was that a naturalistic context and specifically a garden could represent a strong embodiment of our music research and provide a symbolic dimension to sounds and music that were usually described as artificial and abstract. Integrated within the garden life, they become relevant part of a living metaphor, expressing and enhancing the multilayered complexity of a naturalistic environment. A first result of this important meeting was the foundation of Giardino Sonoro La Limonaia dell’Imperialino (http://www.timet.org/events/rinaturaprogress.htm) in Firenze, a sonic garden lab where we are able to test and verify the main implications of our sonic garden installative solutions. You could see our sonic gardens as hypothesis for a livable sound city, oasis where our ears would acousticly explore what the noise of the whole town can become after a music transfiguration! A strong stance and a practical contribution to the sonic planning of a city, representing and exemplifying the qualitative alternative to the daily urban acoustic chaos. Timet and Stefano Passerotti build their own loudspeakers - we call them sonic objects - and find the engineering solutions to obtain the highest integration between technology and nature; since our very first commissions we have been paying attention to the chromatic cycles of plants, gestures and postures suggested by sound diffusion through out plant locations, plant sizes and their orientation. Landscape historical hints on architectural perspectives often conducted our sonic garden installative work. We are at the real beginning. Brusci believes that music composition will be strongly affected by garden needs, botanic living rules and symbolic history. But the circle of influences is never strictly one way oriented." "A Tuscan traditional kitchen garden resonating of sounds from the everyday family life: noises, human dialogues and popular chants. Sounds are diffused by sonic objects, designed coherently with shapes and meaning of the garden itself. The sound will be acoustically and electronically integrated in the botanic world. Integrated electronic means are used to interleave the invisible and real spaces of the garden. Electronic and botanic build a further neural system of the spot, creating conditions for a multiple and hyper-historical perceptions of the garden space. The created garden space is actually a tribute to the human perception and deep understanding of our complex and multi-layered environment."